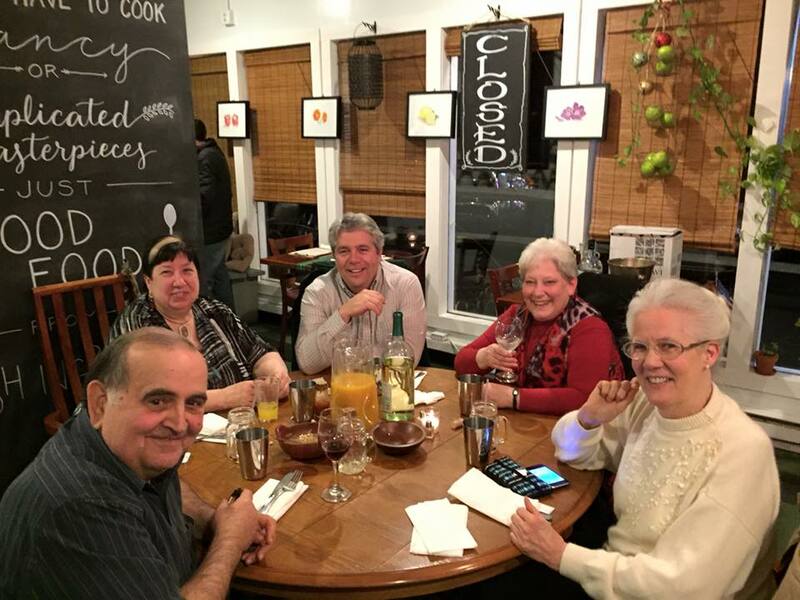 2015 holiday party at Mikuna. A rare sighting of JoAnn out of the studio! ​I like to think that I came into pottery by what I call the “back door”. I wasn’t so much interested in the clay as I was in creating something that would take me out of myself and, at the same time, into myself. I had just lost my grandmother (whom I adored) and my father (with whom I still had “issues”). I was working a high stress job and raising two teenage kids. I needed a new creative outlet. I made my first “bucket list” at forty, after those two deaths. I was determined not to leave a stone unturned or an avenue unexplored in all the things I wanted to do with my life. Pottery was the second item on the list. After the clay seeped into my pores, the rest of the list vanished. I was totally unprepared for my first clay class. I was overdressed, my nails were too long, and I had no idea what to expect. I have never looked back. You know the saying, when the student is ready the teacher will appear. My teacher appeared in the form of a crusty, old gentleman who really did not want a beginner student, but I convinced him otherwise. I spent five nights a week in his studio and every weekend for about a year and a half, immersing myself in clay, absorbing all his knowledge. Slowly I became a ceramicist without any formal education in the field, just hours and hours of work that felt like play. I left my high-pressured executive job a mere two years later, and started teaching pottery so I could learn even more. I have been throwing, teaching, sharing my love of clay and hopefully influencing some folks along the way. My studio is now located in the Pocono Mountains of Pennsylvania where I live and work a half day everyday. Twelve hours is a half day, right? Fortunately, it doesn’t feel like work and there I found the key to happiness…going to work everyday and not being able to tell the difference between work and play! 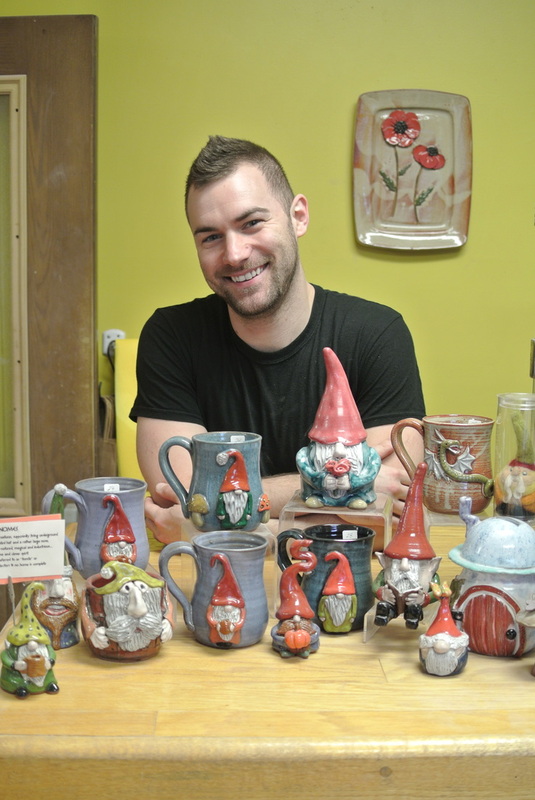 MudWorks Pottery has grown in leaps and bounds over the past five years. It is now a full production studio and I manage a staff of 15, creating whimsical and functional pottery to retail and wholesale customers all across the country. Every piece is still thrown on the wheel, hand dipped in our own lead free glazes and hand painted. We also have a gift shop open to the public year round! Bonnie is a retired elementary school teacher and proud mother of two children. She joined The MudCrew about three years ago. She loves all different crafts, and knows how to sew, quilt, draw, paint, needle felt, bead, and crochet. She enjoys hiking and biking, she likes owls and horses, and takes her coffee with cream no sugar. And, oh yes, she paints lots of pottery at MudWorks Pottery!! Ryan photobombing his students while they pose for their mug shot! Ryan graduated from Keystone College with a BS in Art Education. He has been part of The MudCrew for the past two years. He teaches most of our classes and has a hand in almost every part of studio production. Future plans include one day owning his own studio and creating his own ceramic work. Marq is the director of shipping and receiving, stock manager and final product inspector. He handles a lot of the filing and clerical tasks in shipping and the office. He also makes sure the gift shop runs smoothly and looks sharp, and our customers are satisfied. More importantly, he is our Mr. Happy Ray of Sunshine, keeping positive energy flowing in the studio and constantly raising the happiness levels. And most importantly, he is the Baked Goods Master, in charge of cakes and pies for all birthdays and studio celebrations! Marq graduated from Midwestern with an Associates of Applied Sciences degree in Business Administration. Deanna is a graduate of Northampton Community College, focused in the Arts. She has been working at MudWorks for five years with a few months off to start a family! 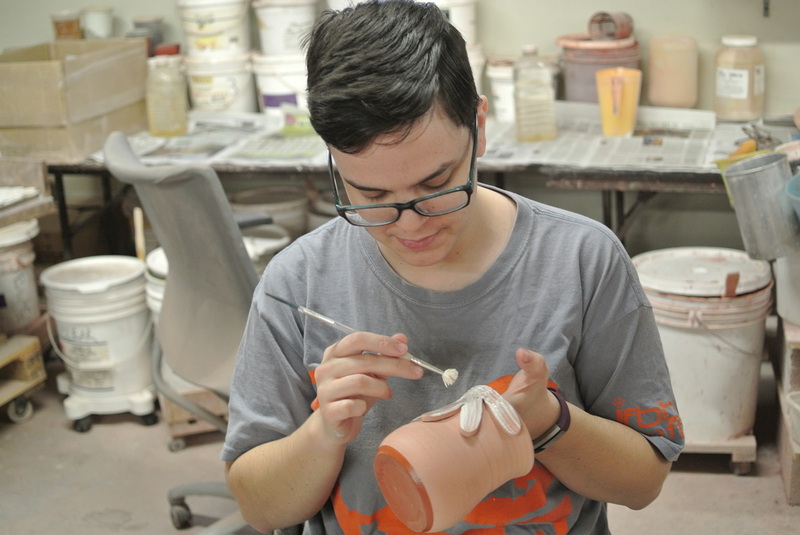 She mainly works at attaching the applications to the various mugs we make. Sam also attended NCC and loves working in the Arts. Her first love is photography, specifically photographing infants and children. Her second love is anything to do with outerspace, NASA, and the solar system. She's been employed at MudWorks as Studio Assistant for the last two years, making sure all the mugs are up to snuff!